We are thrilled that so many families are looking for a seasonal site at Sunfox. We have published a list of sites that have become available for 2019 below, and have begun contacting those campers at the top of our waiting list. We would be happy to add you to our 2019 seasonal waiting list, but based on the current length of that list (and the limited number of sites available), we may not be able to accommodate your request. For those interested in a 2019 “spring seasonal”, a “summer seasonal” or a “fall seasonal”, we will start taking those reservations, as well as 2019 stays of a month or longer, on December 1, (based on availability), while most other reservations start on January 2, 2019. Sunfox offers a limited number of Seasonal Sites, as well as a variety of shorter camping packages, such as “spring seasonals”, “summer seasonals” and “fall seasonals”. A wide range of seasonal sites are offered, with full-hook-ups (with water, metered electric, 48-channel satellite cable TV, wifi and a sewer connection) or without sewer (dry well for gray water & pump-out service available). We are able to accommodate any type of standard RV, including 40’ trailers with slide-outs, with some sites equipped for Park Model units, up to 12’ in width, with 30 AMP service. For both safety and appearance purposes, each RV is subject to approval, and is based on initial acceptance of an RV no more than 10 years old. Any seasonal request for an RV more than 10 years old must be accompanied by a photograph of the unit. For all our long-term sites, site improvements such as decks, storage boxes and attached rooms are permitted, but must meet the specifications of Sunfox Campground. 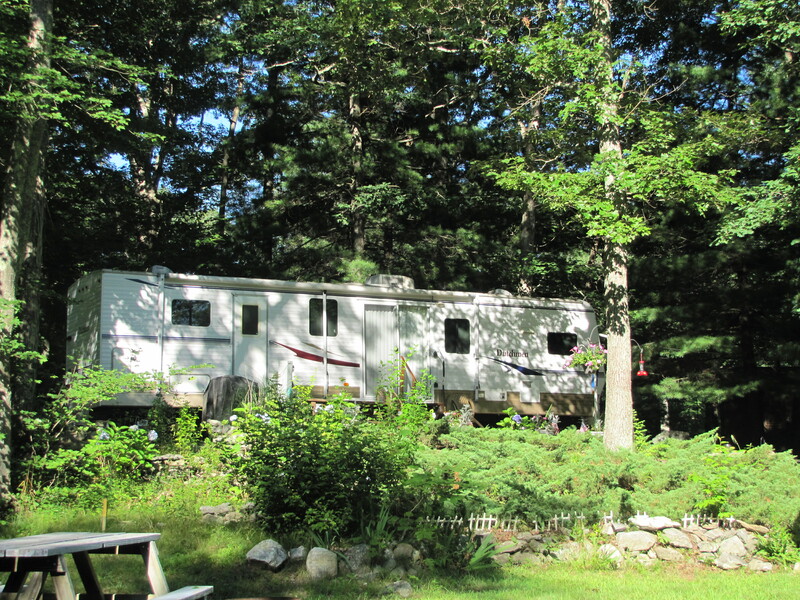 Please note that per CT State statutes, any RV on location for more than 90 days during the camping season will be subject to personal property tax assessment from the Town of Lisbon (as well as on any deck or attached room). Sunfox offers the best and most complete seasonal camper program anywhere. Our seasonal agreement covers a full 7 months—from April 1 until October 31 (with free on-site winter storage for campers reserving the following season). Please note that during the spring and fall, when school is in session, children are not permitted for extended duration stays, but are allowed during weekends and school vacation periods. In addition, golf carts are NOT permitted for camper use. However, those in need of assisted transportation may consider 3 or 4 wheeled handicapped scooters. Electricity is charged separately, based on actual metered use. Each seasonal site receives 1 wifi ticket for the season. If additional wifi tickets are needed for additional devices, the cost is $30 for the season. Seasonal Site fee is based on two people. Additional Person Annual Fees for children, grandchildren, grandparents etc (per person for entire year—based on age as of 4/1/19). Those who do not pay the extra person fee for the season are subject to posted visitor fees for each visit. Payment Schedule: 1. $500 initial Deposit due upon reserving 2. $1000 payment due February 15, 2019 3. Balance due by April 1, 2019. Any seasonal balance unpaid by April 15, 2019 is subject to late fee charges of 18% annually, while any balance unpaid by May 15, 2019 may result in removal of RV. Pay in full discount…for our current seasonals who are re-booking for 2019, a discount of $100 is offered if the fee is paid in full by August 31, 2018 (cash or check only). For any NEW seasonal reservations, a discount of $100 will be offered to any site paid in full by November 1…and free, winter storage will be included with a new seasonal booking! “Upgrade Your RV”…Any seasonal who upgrades their site with a new RV (either a 2019 or a leftover 2018 model) will earn a $50 credit toward 2019 electric billings. 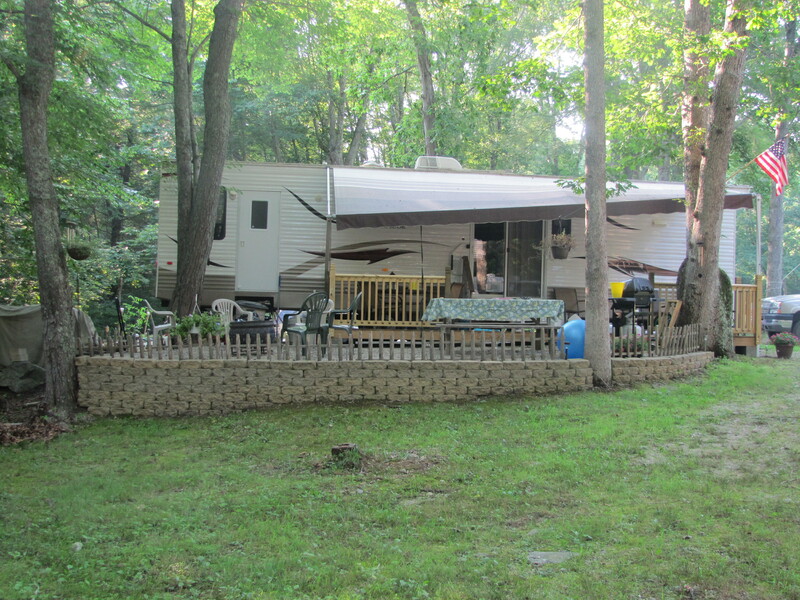 “Improve Your Campsite”…As we encourage our seasonal campers to maintain attractive sites, we are offering a 5% credit toward your following year seasonal site for any site improvements made during the current season (such as materials for a deck, skirting your RV, etc), up to a maximum of $100 earned (if you spend $2000 on site improvements). Add a new awning, patio furniture, a grill or storage box, and earn 5% toward next year (be sure to save a copy of your receipts). Partial “Short” Seasonals–Our 2019 “short seasonal” information is shown below. We will begin taking reservations for these programs on December 1, 2018. 2019 Early Spring Special: April 5 until May 19: Enjoy 7 spring weekends with free on-site storage in between. $599 for a site with water, electric, and satellite cable TV (pump-out service available). These specials do not include a 2nd site free on our “2 for 1” weekend. This program is limited to those campers using the site on weekends and any recognized holidays or school vacation periods (1 week of mid-week camping permitted), and is not intended for those seeking daily use throughout the period, for which published monthly rates would apply. Rate includes up to $60 of metered electric usage. Limited availability. Sites available may include those in 20-30 range. Reservations may be made starting Dec 1, 2018 for this program. We also offer our “Full Spring Seasonal”, which runs from April 5 through Father’s Day Weekend (June 14-16), with those 11 weekends for $1099. 2019 “Summer Only” Short Seasonal: June 21 to August 30 (the Friday that starts Labor Day Weekend), this plan includes 10 full weeks of the summer for just $2299 (a savings of $100 per week off the weekly rate) for a site with water, electric, and satellite cable TV (dry well for gray water & pump-out service available). Perfect for those snowbirds that only come north for the summer. Includes up to $120 of metered electric usage. This special does not include off-season storage. Sites available may include those in 20-30 range, with limited availability. Reservations may be made starting Dec 1, 2018 for this program. 2019 Fall Special: September 13 to October 14: Enjoy 5 fall weekends, including Halloween #1 and Columbus Day, for just $599 for a site with water, electric and cable TV (pump-out service available). These specials do not include a 2nd site free on our “2 for 1” weekend. Rate includes up to $60 of metered electric usage. This program is limited to those campers using the site on weekends and any recognized holidays or school vacation periods, and is not intended for those seeking daily use throughout the period, for which published monthly rates would apply. Sites available may include those in 20-30 range, with limited availability. Reservations may be made starting Dec 1, 2018 for this program. Storage: While winter storage is included with our full seasonal when reserving the following year, if electing on-site storage with our short seasonals or for any other purpose, the rate is $150 for Winter Storage On a Campsite (November 1 until April 1). Year-round Camping 2019-20: Sunfox has only 6 sites that have been in pre-existing use for winter camping, and all 6 were reserved for the 2018-19 winter. There is the possibility of an opening for 2019-20. The rate for the “full winter” of November 1, 2019 until April 1, 2020 (5 months) is $2500 (an average of $500/month—payable at $550/month for Nov-Feb, and $300 for March…or $2400 if paying in full by Nov. 1), with winter water, sewer (or included pump-out service every 14 days), Satellite Cable TV, plus metered electric. Although it is unlikely that any winter site will be open for less than the full 5 month period, a monthly rate of $600 plus electric would apply to a shorter winter stay of 1-4 months. Per CT State Statutes, the town of Lisbon will assess a personal property tax on any RV that is located at Sunfox for a period of greater than 90 days as of the annual assessment date (typically October 1). Many campers choose to register their RV locally, as the mil rate in Lisbon is very low (most recently just 19.5), compared with many other CT towns. For example, an RV worth $20,000 would be taxed at about $275. Therefore, all “full seasonals” are subject to this assessment, while campers opting for the “short seasonals” would not be assessed by the Town of Lisbon unless the combination of programs creates a stay of greater than 90 nights where RV is at Sunfox as of assessment date. As of March 21, 2019. Pending current seasonal relocations. Although this list is updated frequently, please call (860) 376-1081 or visit us for the most current site status.